Inquiring minds want to know: Where's the cheapest gas? GasBuddy can tell you. The site collects real-time prices from some 750,000 volunteer price "spotters," who send in daily updates from their local stations. With prices varying by up to 50 cents from one station to the next in some cities, it pays to stay informed. 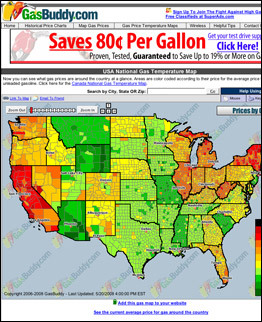 A heat map displays where prices are currently the highest (California) and lowest (Wyoming). GasBuddy also shows you how prices have changed over time and can send mobile updates to your phone. Other similar but less comprehensive services include MapQuest's Gas Prices and Gas Price Watch.